Our clients can avail from us outstanding range of Side Embossing Machines, which are highly acknowledged for its high operational functionality. These machines are having one roller patterned and the other roller is dumb, so after sheets, or Coils are put into them, only one side will be embossed with pattern. Additionally, our embossing Machine offers lower operational cost and come with strong machine frame to endure the heavy pressure. Also, the rollers of these machines are carefully machined and meticulously engraved. Also, these machines offer high Production Speed and can be availed at highly cost effective price. We are the leading provider of Pilfer Proof Caps Making Machinery, which is engineered to perfection. Further, our range of Pilfer Proof Caps Making Machinery is fabricated with high grade raw materials. Moreover, the machinery is highly acknowledged by our clients as it is incorporated with latest technology in order to provide durable and dimensionally accurate pilfer proof caps. 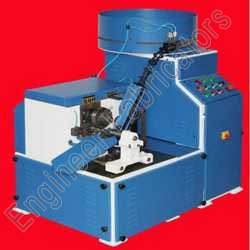 Additionally, our range of machines is appreciated for its high performance, durability and exhibit longevity. Also, these machines can be availed from us at reasonable prices.